The first election of the sham that is Con-a-thon 2016 is coming up this Monday and everyone is getting in some late minute BS slinging before Iowans go to the polls in the Iowa Caucuses. Donald Trump made quite a ruckus (what else is new!) this past week by bypassing the Fox News Republican debate this past Thursday because Donald Trump doesn’t like Megyn Kelly. Geez! For a tough guy, Trump sure is acting like a baby. But again, what else is new for this megalomaniac who recently bragged that he could shoot people in the middle of New York and still not lose voters. While this statement shows how dangerously psychotic Trump is, it says more about how insane Trump’s supporters are because he’s actually right. Donald Trump could murder innocent people and his demented supporters would still vote for him. Speaking of people supporting Trump, he’s got quite an eclectic list of celebrity endorsements heading into Iowa. Rolling Stone has another list. If you look at the lists, there are a lot of authoritarian, tough guy, manly men like Arizona’s own Joe ‘Just Call Me God’ Arpaio, Hulk Hogan, Mike Tyson and Russian President Vladimir Putin who said of Trump “he’s a bright and talented person”. We guess it takes a tyrant to know a tyrant. We’re sure that Putin and Trump could team up and subjugate the hell out of the rest of the world just like Stalin and Hitler did. Of course, all of these aggressive egotists would rather fight and kill than use something peaceful like diplomacy. On the female side, there’s Ms. Ubetcha, Sarah Palin, who gave the strangest endorsement speech of all time (we like Stephen Colbert’s mockery of it). 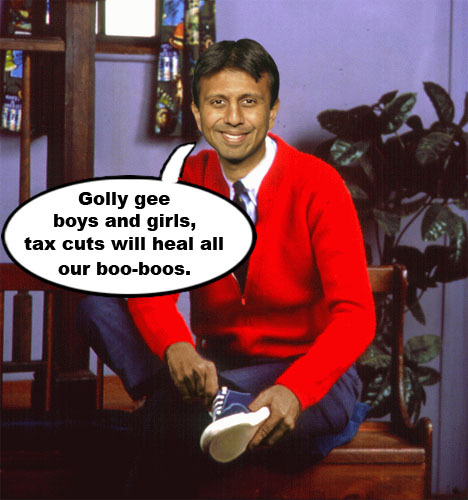 Conservative harpie and living skeleton Ann Coulter, anti-feminist Phyllis Schlafly and empty headed reality star Tila Tequila all are Trumpeters on Trump’s solid gold bandwagon. But probably the strangest endorsement was by John Wayne. Although the Duke has been dead since 1979 , his daughter Aissa said that if John Wayne were alive today, he would endorse the Donald. You see Donald Trump’s 19th century mindset sits perfectly with the cowboy image embodied by the Duke. So to make America great again, we just have to make everything like it was back in the days of the Wild West (everybody’s got a gun; shoot first, ask questions later; tough, tough, tough; kill, kill, kill, etc…). We think Donald Trump’s motto should be, “We’re Going Back To The Future”. Megalomaniac GOP candidate Donald Trump modestly acknowledges his ‘greatness’ to his adoring fans like Vladimir Putin, Sarah Palin, Ann Coulter and the ghost of John Wayne. This will be our last post of our Ann Coulter retrospective because quite frankly we’re sick of her and we don’t want to waste any more of our precious energy on this pile of waste. Remember when the Living Skeleton said that ‘Jews can be perfected by finding Christ’. back in 2007? 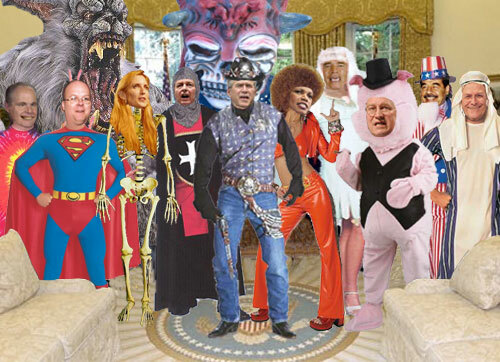 Here’s a photo-toon from our October 28, 2007 issue. Yes, the Nazis would have been proud of you Kommandant Coulter. 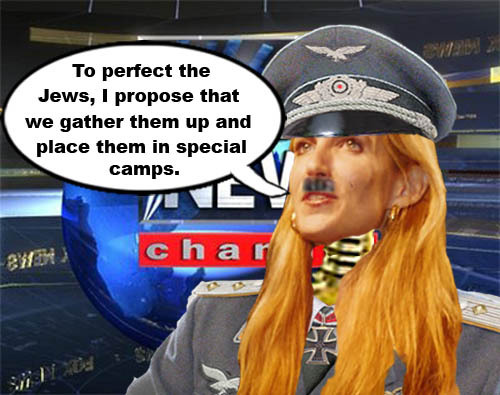 Neoconservative author and pundit, Ann Coulter, recently appeared on CNBC talk show, The Big Idea, and proudly proclaimed that Jews needed to be 'perfected' by becoming Christian. Continuing with our Ann Coulter retrospective… Remember the time when Ann Coulter joked about slipping some rat poison into then Supreme Court Justice John Paul Stevens’ creme brulee? Hmmmm. Sounds like Ms. Coulter would be perfect for Hell’s Kitchen. This photo-toon from our February 13, 2006 issue depicts Chef Coulter delivering the goods. What a ray of sunshine she is! 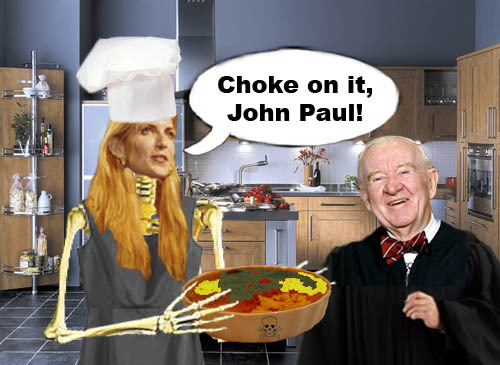 Neoconservative author and commentator Ann Coulter thoughtfully bakes up some creme brulee loaded with hemlock, arsenic and other tasty toxins for liberal Supreme Court Justice John Paul Stevens. She's just joking, of course. 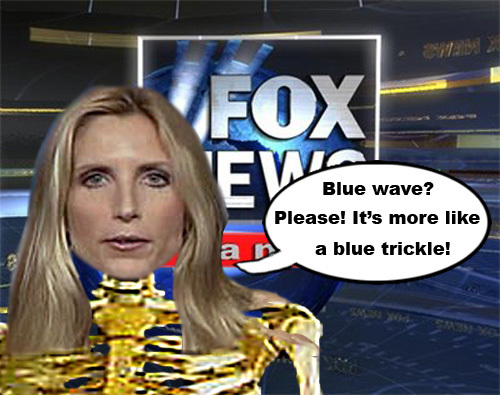 The specter of right wing conservative angel, Ann Coulter, reared it’s ugly head again recently. In an effort to be her usual charming self, Ms. Coulter attempted to mock the #BringBackOurGirls campaign on Twitter and Facebook that completely blew up in her face — hilariously. We don’t make fun of neocon personalities like Rush Limbaugh, Bill O’Reilly or Ann Coulter very much anymore because frankly it’s just not worth it commenting on piles of dung that are shaped like human beings. 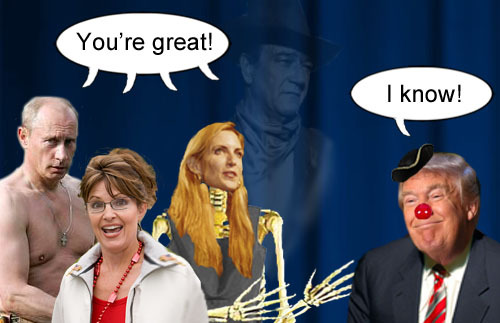 But we’ll run a brief retrospective of Ms. Coulter with a couple of our favorite photo-toons from the early aughts. Here’s one from June 19th, 2006 where Annie aimed her rapier wit at those ruthless 9/11 widows. 'Compassionate' conservative author, Ann Coulter, gets a ringing endorsement on her new book, Godless: The Church of Liberalism, in which she comments on the 9/11 widows, "These broads are millionaires, lionized on TV and in articles about them, reveling in their status as celebrities and stalked by grief-arazzis. I've never seen people enjoying their husbands' deaths so much." .